Mary Douglas Leakey was born Mary Douglas Nicol in London, England, on February 6, 1913. She was the only child of Erskine Nicol, a landscape painter, and Cecilia Frere Nicol. Much of her childhood was spent traveling abroad with her parents, except during World War I (1914–18; a war that involved many countries in the world including France, Great Britain, Russia, the United States, and their allies fighting against Austria-Hungary, Germany, and their allies) when her family spent the time in England. At the house of her mother's aunts and grandmother in London she was first introduced to dogs, marking the beginning of her strong affection for animals, an important part of her life. After the war, Mary's family resumed its annual cycle of European travel, followed by a return to London in summer to sell the paintings that her father produced on their travels. Mary's early education was largely informal, although she did attend school in France for a short time. Her father taught her to read and some mathematics, and he also inspired her interest in the natural world and in archaeology (the study of ancient human life based on the things that were left behind). While living in the Dordogne region in France, near many prehistoric caves, Mary was exposed to Paleolithic (over 2.5 million years ago; the first period of the Stone Age, a time when stone tools were used by humans) archaeology which, combined with her artistic talents, formed the basis of her career. Her father died in France in 1926. Mary and her mother returned to England, where she unhappily attended several convent schools in Kensington and Wimbledon. Mary was an independent person and was expelled twice from school for her spirited behavior. Between 1930 and 1934 Mary took part in excavations at Hembury, Devon, and attended lectures in geology (the branch of science involving the study of the Earth) and archaeology at London University and the London Museum. She also began drawing stone tools for publication. She was introduced to Louis Leakey (1903–1972) as a possible artist for his book Adam's Ancestors and was hired. They were married in 1936 and had three children, Jonathan, Richard, and Philip. Mary moved to Kenya with Louis and worked with him in East Africa for much of her career. She introduced modern archaeological techniques to East Africa. Her initial East African excavations were the Late Stone Age sites at Hyrax Hill and Njoro River Cave, and she was the first person to describe the important dimple-based pottery from East Africa. She also worked at a number of other sites, including Olorgesailie, which was famous for its great number of middle Pleistocene (commonly known as the Ice Age) hand axes. She also worked with Louis on several East African ape sites, and she was instrumental in the recovery of many fossil ape remains. In 1951 Leaky studied and recorded the beautiful Late Pleistocene Tanzanian rock paintings that years later formed the basis of her book Africa's Vanishing Art. Although she is best known for her association with human fossil sites, she considered her work on the rock paintings one of the highlights of her career. In spite of Mary Leaky's primary interest in art and artifacts, Mary Leakey was best known for her amazing ability to find fossils and for her excavations at two of the most famous hominid (dealing with any of the primate families) fossil sites in East Africa—Olduvai Gorge and Laetoli, both in Tanzania. 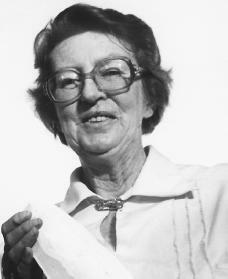 Beginning in 1960 she established a permanent base camp at Olduvai Gorge from which she directed excavations. The previous year Leaky had discovered the first hominid example from that site, "Zinjanthropus boisei," whom she and Louis nicknamed the "nutcracker man" because of its huge jaws and molar teeth. "Zinj" is now recognized as the type specimen of Australopithecus boisei, an extinct (no longer in existence) side branch of the genus Homo. She soon found another hominid more closely related to modern humans, Homo habilis or "Handy Man," providing evidence of coexisting hominid groups one to two million years ago in East Africa. Leakey's research at Olduvai lasted more than twenty years and in spite of many fossil finds focused mainly on the specific descriptions of the archaeology. She initially detailed the archaeology of Beds 1 and 2 and later, more recent levels, contributing greatly to the understanding of Pliocene-Pleistocene (an ancient time period) lifeways. In 1974 Leakey began well-organized excavations at Laetoli, which produced australopithecine (relating to an extinct form of hominid) skeletal remains the same year. Two years later the first of several sets of bipedal (having two feet) hominid footprints were discovered at the site, proving skeletal evidence for bipedalism (the walking on two feet) at a very early date. The footprints were made as australopithecines walked, in at least one case together, through an ash fall from a nearby volcano. These finds caught the attention of the world, as they "humanized" the discoveries of our distant relatives. Like many East African early hominid sites, Laetoli was well dated and provided evidence that full bipedal movement, a major human milestone, was achieved by 3.75 million years. While she never accepted the contribution of the Laetoli hominids to Australopithecus afarensis, she recognized them as the earliest definite hominid sample known at the time. Laetoli produced a number of skeletal elements of Pliocene australopithecines, but ironically, given Leakey's primary interest, no stone artifacts were ever found in these early beds. Mary Leakey, in addition to her research, found herself assuming many of Louis's more public roles after she was widowed in 1972. She spent considerable time traveling to give lectures, raise funds, and receive many honors from institutions around the world. Although she always considered herself primarily an archaeologist, and her professional life was of greatest importance to her, she remained involved with her family and was very close to her children and grandchildren. In 1983 she retired to Nairobi, Kenya, to be nearer to her family. There, she continued to work on her manuscripts until her death in December of 1996. Heiligman, Deborah. Mary Leakey: In Search of Human Beginnings. New York: W. H. Freeman and Co., 1995. Leakey, Mary. Disclosing the Past: An Autobiography. Garden City, NY: Doubleday, 1984. Leakey, Mary. Olduvai Gorge: My Search for Early Man. London: Collins, 1979.